"On the way to school one morning, Airi loses her mirror - one that had been passed down to her through generations - and suddenly finds herself in a bizarre situation. Never in her wildest dreams did she expect Aram, a little boy from a magical kingdom, to have emerged from the mirror in the short time it took her to track it down!" Another one of my favorites. 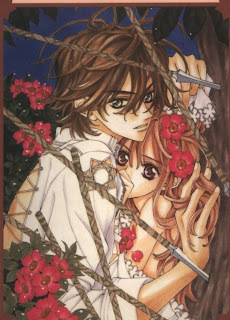 I love Matsuri Hino's drawing style. There is just something so flowy about it. She also is the author of Vampire Knight and Captive Hearts and even though I like those series this one is definitely my favorite of hers. The main characters are Airi and Aram. Aram travels to Airi's world (our world) through a mirror that she has from her mother. Aram has had a spell placed on him by his older brother, the intention was to make him grow into an old man. The spell only half worked and instead when Aram is in complete darkness he turns into a boy Airi's age (there is actually only a 3 year age difference between them). The only way to turn him back his a kiss from her (his chosen maiden). Whe he is little Aram he can use magic, when he is big Aram he can not. This obviously causes some awkward situations not only in Airi's world but also in Aram's. When they travel back into the other realm they find out that Airi has more of a connection to it then they knew. Since it's only 4 volumes it's hard to write too much. I don't want to give the whole story away. Actually thinking about it for my feature today I went back a reread some of my favorite parts. 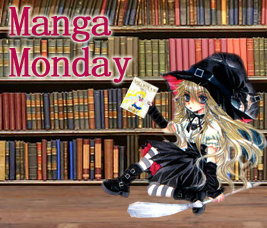 Barnes and Noble actually has there own Manga Monday where they feature titles for 50% off. Yay Vampire Knight. I'd like to read other series by Hino. I love the drawings in this. I love Hino's art in general. I'll check this one out.